I won’t lie. I was nervous about this race. My last training run hadn’t gone very well, and since I was in the last corral, the risk of being swept was very high. Add in that Anaheim was experiencing higher-than-normal temperatures and humidity, and I was really not confident. Kirsten had arrived Saturday evening, so we went out to Downtown Disney for dinner and shopping. It was good for me to get my legs moving so they wouldn’t cramp up before the next day’s race. Bed early again, with the alarm set for 3AM. If I wasn’t still on Eastern time, it would have been brutal; though I was eating meals at local appropriate times, so my body was a bit confused for the whole trip. Up, and ready to go in the morning. And, we got to the start in good time. Kirsten decided to slum it in Corral G with me so we could hang out a bit longer. 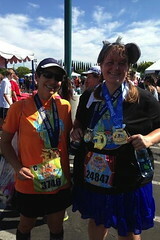 She was in denial about running a half marathon, I was delirious and seriously worried about finishing. It was still relatively hot and humid, and today was 13.1 instead of just 6.2. Here we are hanging out in the corral…the smiles were probably not real. 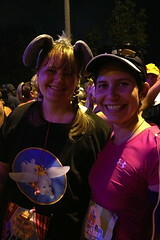 While talking with some of the other folks in the corral, we heard rumor that once we reach mile 10, we were essentially safe. I wasn’t sure if that was true, but, honestly, thinking about it kept me going through a good part of the race. I didn’t have to worry about pushing for more than 10 miles…I felt like I could do that. If it wasn’t true…well, I just decided that if they swept me at mile 11, then they were just bastards. 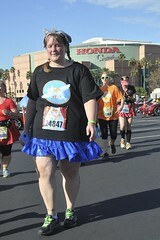 When we got up to the start, we heard that Richard Simmons was in our Corral. Weird. And then, before we knew it, we were off. 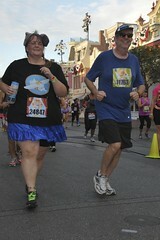 The first few miles were through the two Disney parks, so they were fun. Again, I was running miles for people. I had also planned out a playlist that had songs for each person on my list that should play during their mile. Mom, Thea, Lorna and Brooke got me through the parks. My lifeline, AND the bane of my existence, were the sweepers and the pace bicycle. At Walt Disney World, I was not in the last corral, and I must not have gotten close to being swept, because I didn’t have reminders along the way of how far ahead (or behind) pace I was. For this race, though, there was always someone at the mile markers telling us how far ahead of pace we were. I think that spurred me on for the first half of the race. Around Mile 2 I was 6 minutes ahead of pace. Mile 4 I was 7 minutes ahead. Mile 5 I was 10 minutes ahead. The bane of my existence – pace bikes! By mile 5, though, the heat was getting to me. I was having trouble keeping up my run segments, and found myself walking more and more. Mile 5 was for my nephew, though, and I kept trying to run as much as I could. 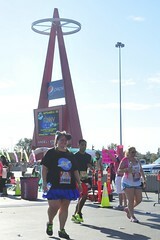 Mile 6 was for Karena, and I kept running, but not as much. 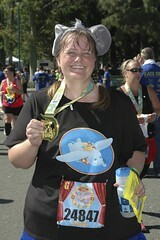 Mile 7 was for Melissa, one of my best friends, who I’ve inspired to start running. When I heard Time Warp come on the iPod, I tried to get in a few more run segments, but I’d be lying if I said I succeeded in getting more than a couple in. The whole race was a bit of a mind game. I kept listening to how far ahead of pace I was, and wondering at what point I could just walk the rest of the race. I kept calculating how much time I lose over minimum pace when I walk, and how many miles I would have before my lead over minimum would be erased. My goal was mile 10 – holding out hope that the 10-mile rumor was true. 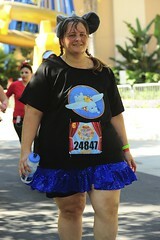 Disney had arranged for there to be “stuff” happening in each mile. 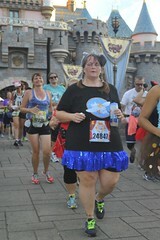 Once we exited the parks, there were marching bands, cheerleaders, and ethnic dance groups along the race route. Around mile 7.5, we started running through classic cars (!). I started to see Model A cars and other very early cars. Over the course of the next mile, the cars got more and more recent, until we went through 70s-era cars. How cool is that? (Before you answer, I own a Model A, so I’m not being sarcastic – I love the classics!) 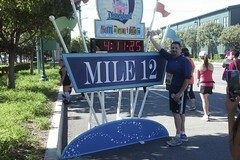 This is also the mile where we ran past the Honda Center (coincidence?). And, by this point, I was walking full-time. The sun was high, the temperature was up, and my body just wanted to quit. I knew I could keep it walking, but if I pushed it to run, I couldn’t guarantee that I would cross the finish. I was far enough ahead of the sweep, that if the 10-mile rumor was true, I should be okay. I kept going, thinking about Jessica for mile 8 and Jaime for mile 9. 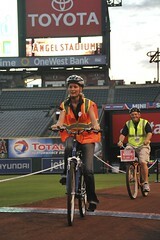 Next up on the trail was Angel’s Stadium, which came during Andrew’s mile. We actually got to run through the stadium, which was a lot of fun. There were scout troops and other people in the stands cheering us on as we went. So cool. I finally crossed the 10-mile sign. Was I safe? I had passed a bunch of shuttle buses in the stadium’s parking lot, so I felt like I had made it. Others around me were talking, and they seemed to confirm the rumor, and also added the tidbit that we basically had an hour after the 10-mile mark to finish. I could do that. 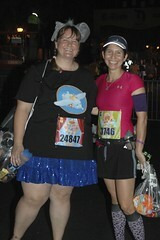 Mile 11 was Sweetie’s. Mile 12 was Kirsten’s, and I knew she was waiting at the finish for me. I was going to get there. I tweeted this, so Kirsten would know I was close. At this point we were also back on Disney property. It was the home stretch. I ventured a smile when I knew the finish was close. I used the last of my energy to run the last bit to the finish. You don’t see the tears here, but they weren’t far off. 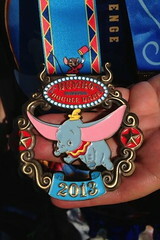 I traded in my wristbands for my Coast-to-Coast and Dumbo medals. After picking up my water, nutrition box, and my checked bag, I found Kirsten in the reunion area. 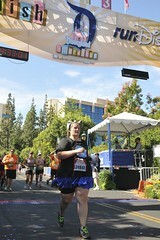 Oh, and somehow, I PRed! Shaving about 6 minutes off my Walt Disney World time. I think it was trying to keep ahead of the sweepers! sounds like a great run – especially through the Angel’s stadium. now i’m really jealous! So proud of you! Congrats on finishing the double dare & for that shiny new PR.